Recently, I stumbled upon this beautiful hour-long Japanese anime film that explores the friendship between a 15-year-old shoe maker school kid and a mysterious young woman in her late twenties. 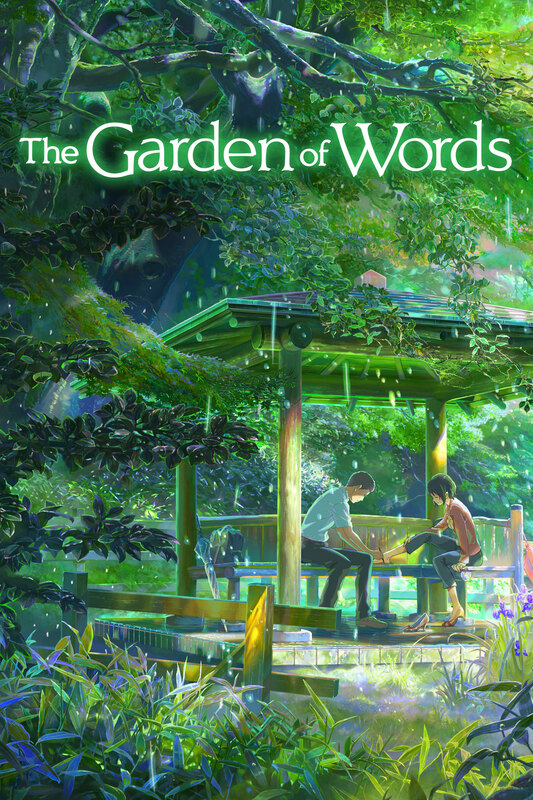 It’s called ‘The Garden of Words’ written, directed and edited by Makoto Shinkai. This film had all three elements I love, especially when combined together. Rain, poetry and a secluded garden. What’s not to love? I associate these elements with sadness and companionship or bonds formed quintessentially from loneliness and sorrow. And I was in a mood to watch something that will give me exactly that, something with no romance and no comedy, yet something that will move me in a way I don’t expect. This one succeeded in doing so. To some extent, at least. In this drama, as far as I can analyse it, both ‘shoes’ and ‘rain’ are symbolic. The two characters help each other to move forward in life. So shoes symbolise their journey that they have to embark upon. Their paths are different, probably never to be intersected again and they have to walk alone, but that doesn’t mean they can’t both help each other in taking the first step. The woman, despite being a grown up, finds it hard to cope with some of the common emotional and social problems of adulthood—of being lonely, misunderstood or mistreated. She finds her solace first in beer and chocolates, then in the company of this guy. The boy, from whose point of view we see most of the film, belongs to a poor family and has more tangible, teenage problems like trying to find what he wants to do in life and the courage to follow it, despite all the doubts in his mind and hurdles on his way. The two characters meet each other in the park only when it rains. The woman is running away from the problems at her workplace while the boy skips his classes whenever it pours. The film has a simple storyline, beautiful dialogues and a peaceful pace. But what I love the most about it is the animation itself. The visual is so freaking beautiful that each frame can be a wallpaper. The observation of the little things in our surroundings and the sounds of nature are captured so well I couldn’t help but admire the talent of the makers. If not anything else, the drama is worth watching for this one feature alone. Although the one scene where the woman has a near breakdown and ‘walks’, both literally and figuratively could have been done better, but the ending (I mean, the place where the two characters end up, individually) was believable and appropriate for the storyline. Anything else would have likely made it cringy. After watching this movie, I tried to look for something similar, but didn’t succeed in finding anything worthy. That was when Netflix recommended a Korean drama called Hello, my twenties to me. And boy, was that the best recommendation of my life! Hello, My Twenties (also known as ‘Age of Youth’), written by Park Yeon Seon, is a coming-of-age drama that explores the friendship between five girls with completely different personalities, pasts and personal problems. Initially, it’s difficult for them to get along with one another, but when forced to live under one roof, they develop a bond. Eventually, this bond becomes unbreakable (which comes pretty early in the show) and what ensues is a series of hilarious and poignant endeavours. Limited episodes: It has 20 episodes in total. Realistic relations: Every relation that these girls share with each other, their parents, partners or whoever is in their life seems real and develops slowly over the time, so you get attached to them. Unique characters: We have a sassy girl with some fatal kicks, a complete girly girl whose colour of life is pink, a shy socially awkward girl who has yet to learn to speak up, a girl who is distant, emotionally unavailable and struggles to make ends meet and finally, a tomboy who is the life of a party. The contrast in their personalities is what makes them so enjoyable to watch. No love triangles (which are surprisingly common in Korean drama, or so I learned after watching a couple more): Of course, there are romantic interests, but the story mainly focuses on the girls, their friendship and their individual lives. Love is not the centre of their universe (at least to most of them), which is a welcome change. A lot of issues superbly dealt with: If I begin to list down all the issues this drama touches upon and handles with excellent maturity (with a pinch—or a bucket—of comedy), the post will be infinitely long, not to mention spoilery. But there is prostitution, violence, traumatic past, attempted murder, bullying and sexual assault. Now now. This might sound scary and even too much to handle for a light, stress-free weekend watch, but trust me on this, it has been approached tenderly and maturely. The show is marked 13+, so a teenager can easily watch this without being subjected to any kind of gore. The tone of the show is still light-hearted, albeit emotional in some situations. So it makes for a good weekend watch. Everyone can take something away from it: There’s coming to terms with one’s past, learning to believe despite the uncertainty of the future, coping with a trauma, being unapologetically yourself even when you find little to no acceptance. A host of messages that you can take away from it. Better yet? None of them are preached. Comedy: Comedy is a major part of this show. It’s almost a separate character because the show has so many underlying themes and serious issues it deals with that it seems downright insensitive to use comedy in such situations. But that’s what makes this show stand out. Comedy surfaces at the most unexpected times and you can’t help but giggle along. i too don’t have an open arm towards k series i guess your article might change my frame of reference , Mithali dhi. Seems they are must watch…… Will surely watch them.